You know--the classic Thanksgiving dessert--key lime pie? This pie has saved me a million times. It is too easy to even talk about. Going on and on, trying to convince you of its simplicity, would be more complicated than you just getting out a can of sweetened condensed milk and making it already. I made a Thanksgiving dinner for our foursome last night, which is a newish tradition I've inflicted on myself. We are always (thankfully) with large, rowdy groups on Thanksgiving, and I'm part of the potluck like everyone else, bringing salad, rolls, sometimes dessert or appetizers. But because of travel, never the turkey, mashed potatoes, stuffing, or yams. Yancey will be working at the station this Thanksgiving, so I wanted to have a little celebration together before the ol' Divide and Conquer sets in. I had planned on not making a dessert, but just couldn't go through with Thanksgiving dinner without pie. 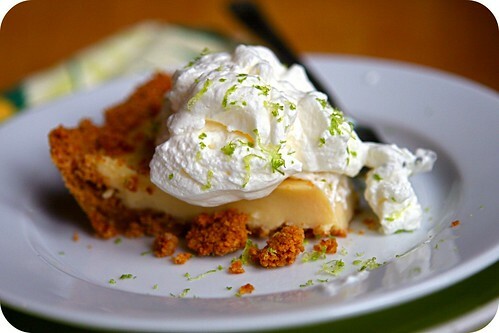 Enter Key Lime Pie. 20 minutes, plus some chill time in the fridge, and just the thing to brighten a dark day. Wyatt juiced limes, I whizzed graham crackers in the food processor, and my trusty pantry supplied sweetened condensed milk. After dinner, full of blistered brussel sprouts, a classic sausage and apple stuffing, and very buttery mashed potatoes, we cut the pie. I'm not accustomed to eating when I am so full. It's that bloated, strangely comforting"It must be Thanksgiving" feeling. I won't wish you "Happy Thanksgiving" yet, because I plan on posting again before then. There are too many things to be thankful for--they get their own airtime. Adapted from Gourmet. Of course, my version doesn't have key limes in it. I used Persian (regular) limes like I always have. Make the crust: Put a rack in the middle of hte oven and preheat to 350. Butter a 9" pie plate. Stir together graham cracker crumbs, sugar, and butter in a bowl with a fork until well-combined. Press crumb mixture evenly onto bottom and 1/2 way up sides of pie plate. Bake for 10 minutes, take out of the oven, and leave the oven on. Make the filling and bake the pie: Whisk together condensed milk and yolks in a bowl until well-combined. Add juice and whisk well (filling will thicken slightly). Pour filling into crust and bake for 15 minutes. Cool completely and put into the fridge for at least 4 hours. Just before serving, whip the cream and sugar together until it just holds stiff peaks. Spread pie with cream or top each serving with a dallop and a bit of lime zest. Note: If you want to make this ahead of time (1 or 2 days), don't put the cream on it. Do that right before you serve it. There are so many things that can go wrong in a day. Forgetting to put out the garbage, missing your bus, refereeing sibling rivalry, or the mail getting soaked. And bigger things, too--losing your job, getting your feelings hurt, worrying about bills, coming down with the flu. And that's what I love about stepping into the kitchen--it's a daily chance for something to go right. And even if your venture fails spectacularly, at least you've been doing something with your hands, creating something, being generative instead of reacting or solving problems. Carving pumpkins with the kids yesterday, I was scheming about how the pumpkin seeds could go right. It seems like a lot of work in the moment--separating stringy flesh from seeds, making sure kids don't fling them everywhere. Finally, a precious bowlful. Curry powder? Cinnamon? Chili powder? I settled on lime zest, olive oil, and garlic powder. I don't use garlic powder a lot, but it's magical, in its way. Fresh garlic on these would be totally overpowering and would burn in a second. God. These were so good. Last night for Yancey's birthday dinner, we had french onion soup, salad with pomegranates and goat cheese, and caramel apple cake. But these stole the show. Three cheers for little things going right. Extract the seeds from one big pumpkin or two smaller ones. Put them in a colander and rinse really well, pulling off any strands of flesh. Shake vigorously, removing as much water as possible. In a medium bowl, toss pumpkin seeds with 1 tsp. coarse salt, 2 Tb. extra virgin olive oil, finely grated zest of one lime (making sure not to get any lime pith in there--very bitter), and 1 tsp. garlic powder. 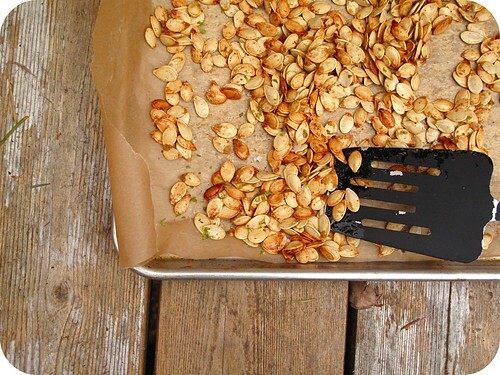 Line a baking sheet with parchment paper, then spread pumpkin seeds out in a single layer. Roast at 375 for about 15 minutes, stirring once or twice. Remove from oven when seeds are dry, golden and dark brown in places, and sizzling. Let cool. They'll get more crunchy as they cool. Add a little more lime zest and salt after they've cooled. We're just home from Sun Lakes with grandparents. Our last hurrah. Wyatt was acutely aware that summer's over. Whenever I tried to ask him how he felt about school starting, he'd say, "Mom! Don't talk about that yet." Serious routine is about to kick in around here. Homework, being on time to the bus stop, diligently trying to get stains out of Wyatt's white polo shirts, Loretta starting preschool. If I start to get overwhelmed by it all, remind me of Sun Lakes and Dry Falls. Remind me of the Ice Age floods that barreled through the desert, turning arid acres into an astonishing patchwork of lakes and canyons. Remind me of the forces that put human endeavors in their puny place, of the deep, cold water that is always there. And remind me of end-of-summer bounty, like bright red Roma tomatoes and peppers, waiting to be diced, doused with lime, and spooned onto rice and beans or into tortillas. Goodbye, summer. Thank you for filling us up. Makes 2 cups. Sometimes called "salsa fresca," this is the sort of condiment I assume everyone knows how to make. You, kind readers, have asked me not to make those assumptions, though. You can add diced cucumber to this, use any kind of spicy pepper, use the cherry tomatoes growing in your garden, or sub mangos or pineapple for the tomatoes. Gently mix everything together in a medium bowl.